Hello again everyone! On Sunday I got back from my trip around Norway, Iceland and to Orkney, and after a few days getting everything back on track I’ve picked up the pace on some of the exciting projects I’ve been working on and I hope to bring you guys soon. In other news, both my iPhoto and my camera are still full of photos from my adventures I can’t wait to share, and I’ll be rolling out over the next few weeks as I work my way through them. 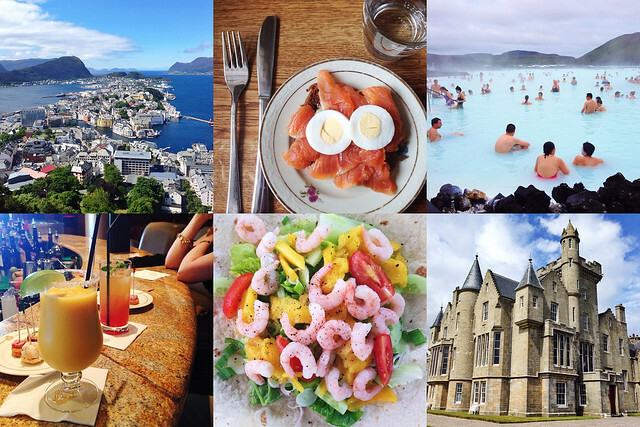 Though I can tell you for sure, next week stay tuned for the second half of my Norway photos, including some stunning panoramas, Norwegian fish soup and one of the best cakes I’ve ever tasted. 1. Looking out over the town of Ålesund in Norway. | 2. Enjoying a traditional Icelandic lunch of smoked trout on rye baked in the ground using geothermal energy in Reykjavik. | 3. Bathing in Iceland’s famous Blue Lagoon was one of the best experiences of my life. More to follow in a full blog post soon! | 4. Kicking off my Summer holiday (before we headed North and it got a fair bit colder!) with some tropical cocktails. | 5. In contrast to the cocktails, starting off my post holiday healthy eating kick with a prawn and mango salad wrap! | 6. Visiting the wonderful Balfour Castle in the Orkney islands. Full blog post on that to follow, too! The Kitchn takes us to Vietnam and shows us how fish sauce is made. They also school us with a (very interesting full of things I did not know) history of rum. Refinery 29 has put together a roundup of the best doughnuts in Los Angeles. Also, Food 52 brings us the history of doughnuts in America. Nouvelle Daily has put together a great piece on saying no to University. While I am grateful that it gave me the chance to live in L.A., and London twice, deep down I still know that it was not really the best decision for me to go, and I wish I’d been given more alternative guidance. They have also put together a great guide to buying flowers on a budget. Lucy reviews a simply stunning looking meal at Jamie’s Italian in Stratford. PUNCH looks at what California’s bartenders are doing about the drought in the state. 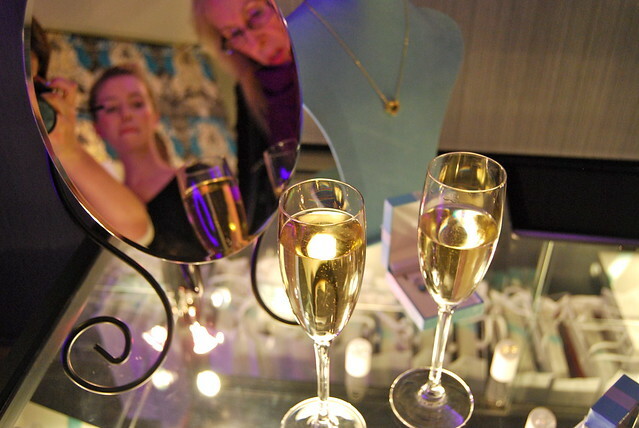 Julia has written a very interesting piece on if the blogging industry is generational. Hayden schools us in the (very interesting) history of ice cream and sorbet. Thanks to Amy, when I finally get around to checking out the Leeds food scene, Shears Yard is going to be pretty near the top of my list. The food looks amazing! Emily shows us how to do some fantastic, and really simple Faux Calligraphy. Also, she has some really great tips to make entertaining at home as easy as possible. Megan Markle, the actress who plays one of my favourite dressed characters on TV, Rachel Zane on Suits, shows us how to get her characters flawless makeup look. She also interviews Jolie Andreatta, the shows costume designer on each characters individual style. Camille Styles sits down with to interview the father daughter duo behind my favourite food website, What To Cook Tonight. They have also put together a great ‘Grilling 101’ post. 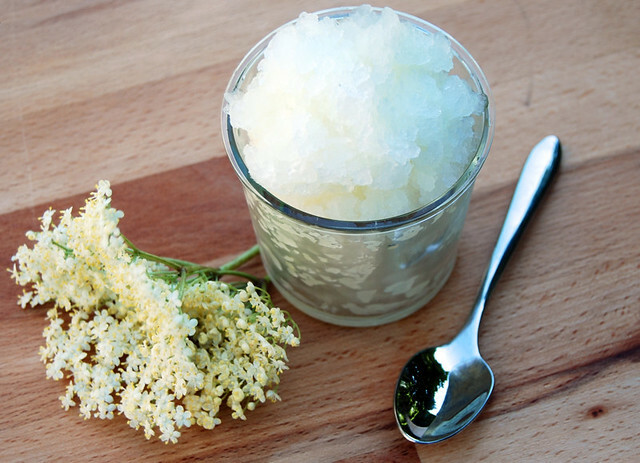 While there is still a little elderflower around, if you head over to the Borough Market blog you’ll find my recipe for a super cheap, super easy and super delicious Elderflower Granita. All you need is a saucepan, plastic tub and a fork! I actually received my degree on Wednesday (I’m now a proud graduate of the University of London with Upper Second Class Honours in English Literature!) so I’m no longer a student, so my student column for Borough Market has come to an end. However, I’ll be back writing a new column that is just being finalised for the market in the Autumn, so keep your eye out for that! (I have a new column with student food starting on an exciting new website at the end of the month, and I’ll be sure to keep you updated.) For now, you can find all of the recipes I have written since the beginning of the year for Borough Market here. 7. Gathering fresh produce from the vegetable gardens. | 8. A little preview of Monday’s blog post, totally delicious Fiskesuppe (Norwegian fish soup) in Ålesund. | 9. Prepping some red peppers to roast for a little bit of soup action. | 10. The conservatory at Balfour Castle. I want this when I grow up! | 11. Throwing together some local strawberries, leftover whipped cream and homemade meringues for an impromptu dessert having family over. | 12. Some of my Barbecue Chicken, Bacon & Honey Mustard Skewers sizzling away on the barbecue. 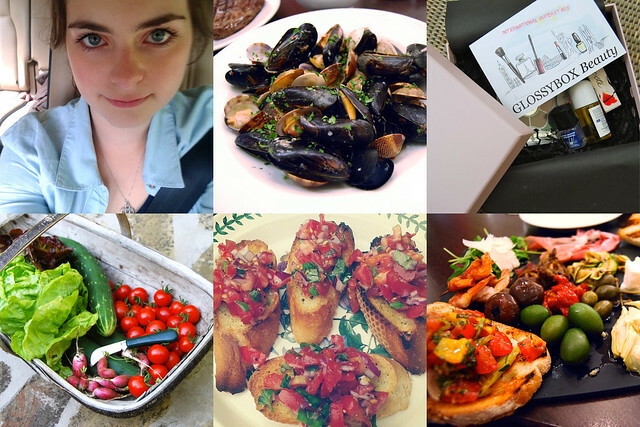 Sophie’s blog, yet again, makes me want to go and eat my way around Sydney. Another one added to my list once I finally make it to Sydney, lunch at Four Ate Five. And The Grounds. Speaking of future destinations, Rose has me convinced that I need to add Lake Como to the list. Claire dines at the new Polpo in Notting Hill, which is right at the top of my list. Cosmopolitan shows us how to get more likes on Instagram. Will Instgram kill off fashion blogs? 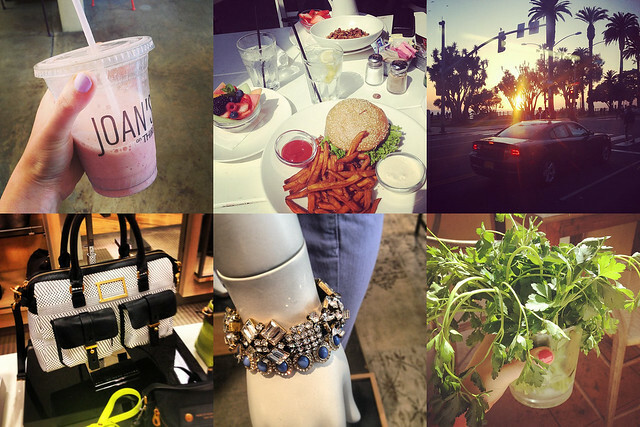 Also, 7 essentials for marketing your blog on Instagram. 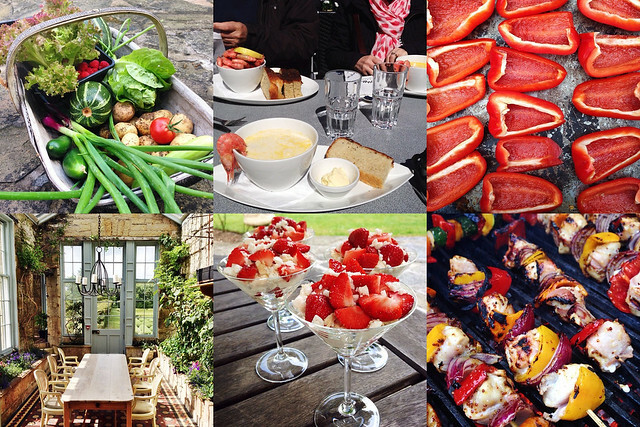 I always love Kristabel’s monthly food diaries and her stunning photos. Julia has put together a lovely little guide to San Francisco. I love the styling for Blogshop in Atlanta. Food 52 has put together a great guide to using gelatine. This natural pink lake in Australia is incredible. Sarah has done a simply stunning patio makeover. Her house is turning out to be incredible! My fellow Borough Market blogger Ed Smith has profiled KERB for Flavour First. The Joint’s luscious looking burgers are yet another reason to visit Brixton Village Market. 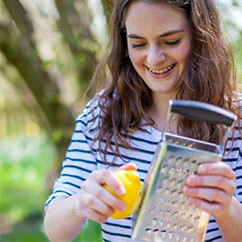 I really need to try Amy Elizabeth’s Soy & Chilli Seeds, just like the ones in my Graze Box! Emiko Davies gives us a rundown on the classic Caprese Salad. Jacintha has taken some photos inside the Islington Ottolenghi store that are simply amazing, I mistook them for the photos from the cookbook at first glance! Nicole has put together a fantastic looking Portland city guide. America? Love & Lemons has put together a great guide to Summer wine and food pairings. What have you been doing this week, and what do you have planned for the weekend?